News just in from Moncada Hispania that the 35m motor yacht South Paw C is now on the market for the first time in more than 10 years. Built by Codecasa in steel and aluminium in 1977 with an interior by Jon Bannenberg, her current owner has treated South Paw C to annual upgrades, the latest refit being in 2013. She accommodates up to 12 guests in a master suite, VIP stateroom and three twin cabins plus seven crew, and twin 775hp Caterpillar engines give her a cruising speed of 12 knots and a range of 4,000 nautical miles. 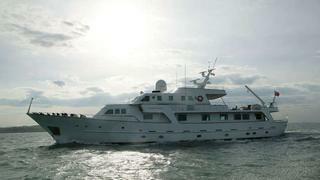 South Paw C has been used as a family yacht and for charter. Lying in San Remo, Italy, South Paw C is asking €1.95 million, VAT paid.